Try to imagine your most beautiful day. Imagine a refined location; an elegant lounge overlooking a green park; a breathtaking view of Lake Garda. The beauty of the place, the expertise of the people able to recommend you the most appropriate solutions for your tastes: high-profile seasonal menu, guest accommodation in rooms and suites, photo shoots, decorative flower arrangements. 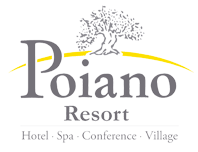 The Ball Room of Poiano Resort is waiting for you.